The Bowser Board is a board that appears in Mario Party 10. It is available exclusively in the amiibo Party mode, where it can be played on when the Bowser amiibo figure is scanned on the . Like the other amiibo boards, the Bowser Board is based around a certain character, who in this case happens to be Bowser. The board resembles one of Bowser's many castles. Enemies such as Lava Bubbles, Bob-ombs, and Dry Bones, as well as Bowser Jr. and the Bowsers' signature airship from the Super Mario Galaxy and New Super Mario Bros. series, can be found on the board. Since Bowser is one of the playable characters when playing on this board, Bowser Party minigames will be played instead of normal minigames. When a game on the board is started, there are three Red Spaces and a Bowser Space. However, a wheel in the top-left corner can change the Red Spaces into Bowser Spaces and vice versa. Three huts with Bowser Jr.'s icon on if can also be found on the board, and are part of events triggered by landing on the Event Spaces next to them. When Bowser lands next to them, he can play a Dice Block minigame to earn coins. When another character lands next to them, Bowser Jr. will jump out of the hut and challenge the player to a minigame. If the player wins, he will give them ten coins. If the player loses, he will take ten coins. Alternatively, he may give the player ten coins without a mini-game. This board's music is based on Bowser's theme in Super Mario 64 and its remake. Characters with confirmed amiibo figures can collect icons of different characters that appear on the board and change a part of the board to a part of that character's board. When passing through by the area in the top-left corner, the player will have to spin a roulette. It will determine the amount of Lose Coin Spaces and Bowser Spaces that will be added to the board. After landing on the Event Space, the player will have to face Bowser Jr. in one of his minigames: Bowser Jr.'s Clobber Cage or Bowser Jr.'s Bonk Battle. If the player wins, they will earn 10 coins. But if they lose, Bowser Jr. takes 10 coins from the player. If Bowser stops on this Event Space, he gets a chance to obtain some coins from Bowser Jr. Bowser will get 1, 5 or 10 coins depending on the roulette. 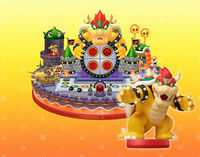 An image from the Japanese website showing the Bowser wheel. If a player (that is not Bowser) encounters Bowser Jr. for the first time, the event description mentions he gives out both coins and Stars. However, he is never seen giving Stars. ↑ Koczwara, Michael (February 20, 2015). Over 30 Minutes of Footage of Mario Party 10. Mario Party Legacy. Retrieved February 21, 2015. This page was last edited on January 3, 2018, at 20:42.